At Burger Bedlam's inception, we came up with, based on our previous experiences, an initial top 5 of the best NYC burgers and burger joints. Included in that top 5 was a burger destination near and dear to our hearts. 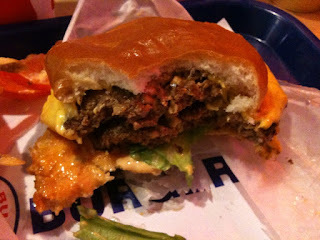 Akin to our West Coast obsession, In-N-Out Burger was Blue 9 Burger. A burger based on the same proud principles of fresh, never frozen meat. Special sauce, double stacked patties and gloriously melted cheese with grilled onions nestled on top. How can you go wrong? Not to mention, Blue 9 Burger was born in the same Big Ten university business school that we graced for four amazing years. 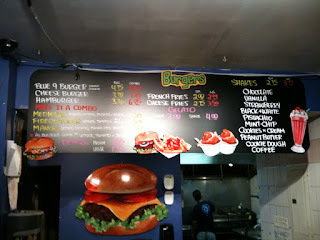 So, when it came time to take our burger review tour to Blue 9 Burger, naturally we were pumped to return after an almost one year hiatus. Would this reunion end happily ever after? Our Expectations: The Blue 9 Burger. As we mentioned, this one draws strong comparisons to an In-N-Out Double Double. Along with the Double Shack Burger at Shake Shack, it's quite often mentioned as the closest you can come this side of the Mississippi. Two fresh, never frozen patties, special sauce, lettuce, American cheese, grilled onions on a soft white roll. Wrapped in paper, soaking up all that juicy burger grease, thoughts of the Blue 9 Burger always made our mouths water. Meat: Freshness? Check. Tenderness? Check. Anything else? Bueller, Bueller, Bueller? How bout a little flavor? Seasoning? Juiciness? As Kyle's Grandma might say, Oye Vey. It just ain't there. As many of our readers had mentioned in our preview a few days ago, this burger's taste has gone south. The meat is the main reason why. As Brett said while eating, "where's the flavor?" We both agree, the meat is fresh, but is sure lacks in the flavor department. The best burgers in NYC all share a common bond, ideal flavor and superb seasoning. 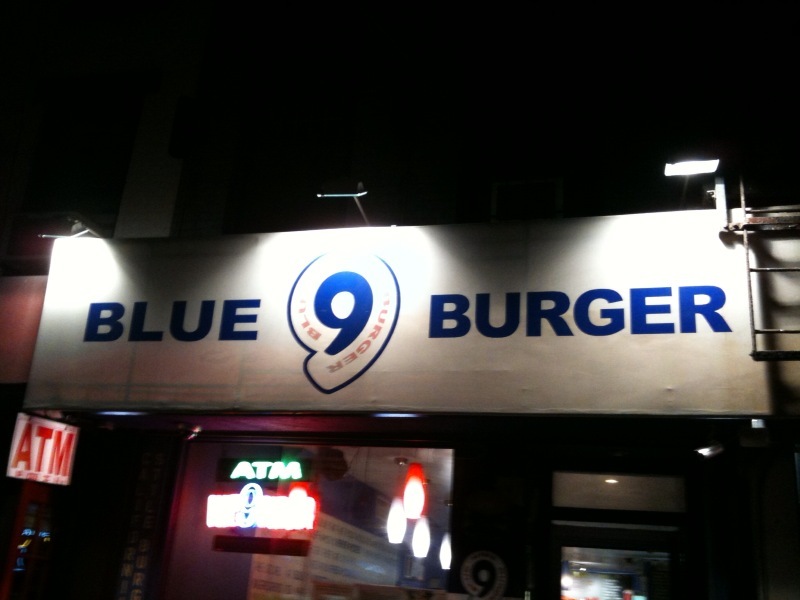 Blue 9, although it can be considered more of a fast food burger, dropped the ball. You can't order the burger to the temperature of your choice, and that likely detracts from the juicy flavor you get out of fresh ground beef. Toppings: The toppings save this burger any further embarrassment. 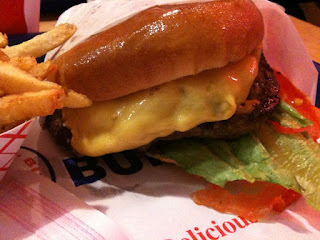 The American cheese is melted splendidly across the patties. The grilled onions add a bit of sweetness to every bite and the special sauce shines above the average flavor we found in the beef. The lettuce is your standard iceberg fare. But do you really get excited about lettuce? Overall, the toppings are respectable, if not just above average. Had they let us down, you were looking at a considerable drop in this burger's ranking...although it might be on its way down anyway. Bun: If Blue 9 got one thing right with their burger, it's the toasting of the bun. That shouldn't be overlooked as we've had some seriously charred buns in our day, its a burger killer. You can't overlook this detail, it makes for bad presentation and poor taste. Who wants a blackened bun detracting from the taste of their burger? Not us, no sir. The soft white roll came out as it should, toasted lightly with a soft center and never falling apart. Thank goodness. Meat (33): Where have you gone, flavor? Solid tenderness and a great fresh composition, but seasoning? Not so much. 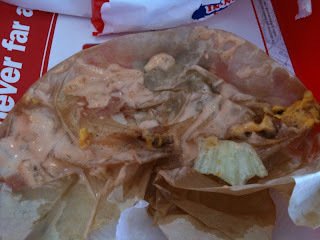 Toppings (22): We never hate on grilled onions, American cheese and special sauce. That combo is one of our favorites. Still, we've had better. Bun (15): Toasted well, standard white roll. So, lets get one thing straight...we are NOT traitors. We love NYC. We love the best burgers in NYC and we otherwise wouldn't have dubbed our site link after what we seek to do here at Burger Bedlam, find the best NYC burger. Still, we hold a special place in our hearts for In-N-Out Burger. If you've had it before, you'd appreciate our affinity for this west coast burger staple. Moreover, you might be hard pressed to argue the presumption that their burger is a drug...because they can cause a serious twitch at the very thought of biting into a Double Double Animal Style. Reminiscing back to our days on Junior year Spring Break in Los Angeles and Santa Barbara, you might even call us addicts based on the amount of Double Doubles we consumed in a 7 day period. We ate 6, yes 6...in 7 days. Each of us, not combined. One day, we had 2. Good G-d. Thankfully we had a pre-med doctor with us, 'cause we needed cholesterol blood work done on a daily basis. That soon to be doctor, our good buddy Jeff, along with his LA companions from our college had talked up In-N-Out 'til we were blue in the face prior to the trip. They certainly knew their stuff. Following that trip, we couldn't get enough. 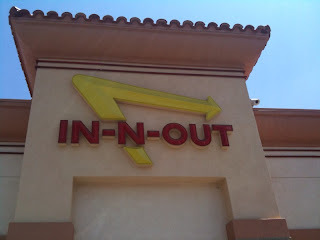 Anyway, Kyle got the opportunity to hit up an In-N-Out on his recent venture west- and in the valley no less! Porter Ranch to be exact. Once again, In-N-Out didn't disappoint. 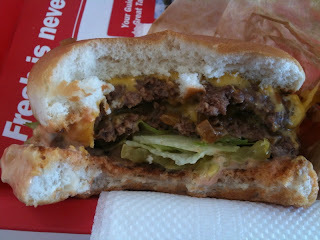 For those of you who have no clue what In-N-Out Burger is (how dare you! 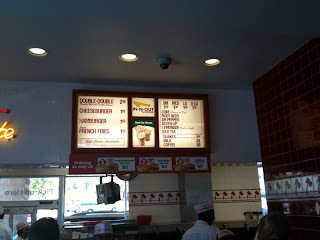 ), check this link for some background straight from Wikipedia: In-N-Out Burger. Additionally, definitely check out their site here. What we love about In-N-Out Burger is the always fresh and never frozen ingredients, the culture, the "secret" (not so secret to a repeat customer) menu, the thousand island based special sauce, and the overall quality of the eating experience. Although the meat might not rival the best burgers in NYC that we rate, the toppings take the cake when it comes to taste and combined flavor of every bite. We highly recommend ordering a Double Double Animal Style. Think Double Shack Burger from Shake Shack, but west coast style. Sound good? Yeah, it is. 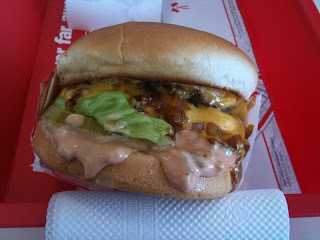 Check out the pics below for some closer details of why we love In-N-Out so much. A full review would come...if our URL were bestburgerla.com, but it isn't. Just know, we love us some In-N-Out. A few bites in, we wish it was Medium Rare, but it's still fast food.